Founded in 2014 by Richard Louis, FitSpace NYC is the culmination of 30+ years of education, training and experience in the professional fitness industry. Located on the Upper West Side of Manhattan, FitSpace NYC is a 1400-sq foot facility which features all new equipment in an intimate and friendly, but “no nonsense” environment. No membership fee! Founded in 2014 by Richard Louis, FitSpace NYC is the culmination of 30+ years of education, training and experience in the professional fitness industry. Richard came to NYC in 1998 and immediately burst onto the fitness scene. He is the 2009 NABBA USA Champion, has placed Top 10 in the 2011 and 2013 Mr. Universe Competitions, as well as 2nd Place Masters Category in the 2012 NPC East Coast Championships. 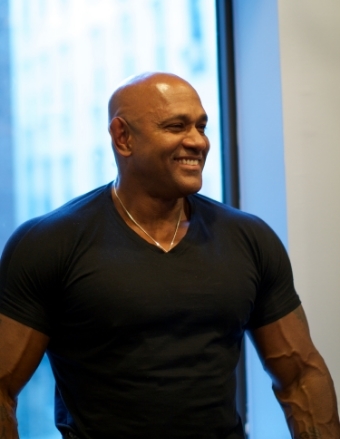 Richard is an ISSA certified Master Trainer who specializes in body transformations and is well known in fitness and bodybuilding circles for his innovative and intense approach to workouts. Despite suffering a "catastrophic failure" to his quadriceps tendon while training for the Mr. Universe competition in 2010, Richard's perseverance, hard work, and dedication to fitness allowed him to overcome this adversity and to place in the top 10 at that very same competition exactly one year later. Richard is passionately dedicated to health and wellness, as well as overall fitness. He works closely with some of the world's top physicians, nutritionists and physiotherapists to give his clients the most effective results possible in a healthy and holistic way. He has developed a reputation for getting incredible results in short periods of time. Richard has trained several prominent actors for their roles in major films/television shows, as well as professional athletes, CEOs, and stay at home moms. His friendly, intelligent approach has helped hundreds of clients reach their goals. Located on the Upper West Side of Manhattan, FitSpace NYC is a 1400-sq foot facility which features all new equipment in an intimate and friendly, but “no nonsense” environment. The space is fully equipped with versatile pieces manufactured by the top fitness companies in the U.S.
We offer our clients a wide range of amenities and conveniences, including fresh towels, spring water, changing room. FitSpace NYC is a private training facility. Call to schedule your appointment. Marvel - The AntMan Workout : Learn from Paul Rudd's personal trainer on how he got into Ant-Man shape!